When it comes to our diets, there is little agreement about what we should be eating. There are vegans, vegetarians, Keto-fans, and everything in between. But seriously, people can get adamant about their opinions on diet! Maybe you’ve experienced this? On social media, perhaps? But, interestingly, almost all diets do have something in common. The one thing that they DO agree on is the necessity of vegetables to a healthy diet. Especially leafy greens! Recently I realized that I needed to get back on track eating a diversity of veggies, especially greens. This spring was pretty tough for us die-hard local eaters, because normally we have our hoophouse that overwinters greens for us to eat, but we had to cut the plastic in December. So that option was out. 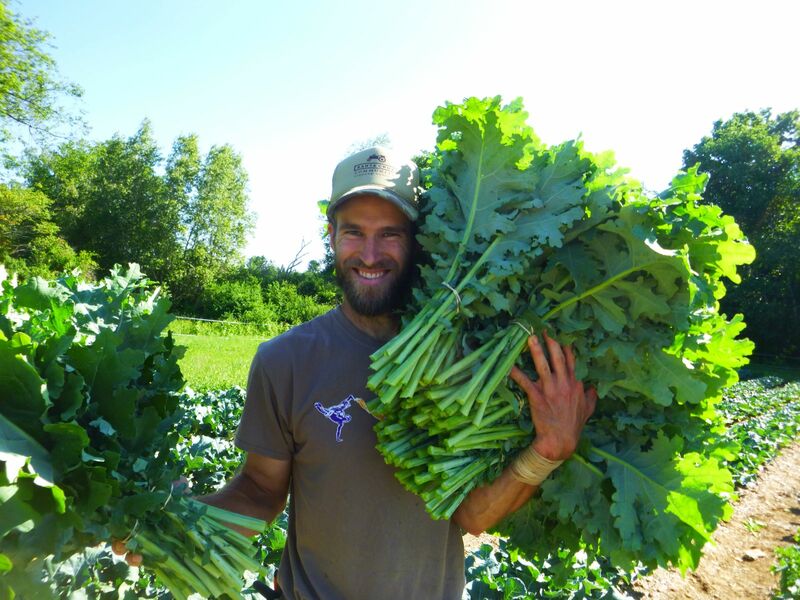 Now that the “harvest season” is upon us at the farm, we are chock full of greens and other delicious things in our lives again. Yay! Of course actually having that whole pile of appetizing greens in your fridge is indeed the first step towards eating more! But really getting them all into your diet can be a little bit overwhelming. Here’s where we can help with inspiration drawn from our own kitchen as well from those of our experienced CSA members! This is a quick solution to not having prepared anything else ahead. In fact we had a breakfast this morning of Scrambled Eggs with Garlic Scapes and a side of buttered steamed kale. But, will it do ya? It should. It gets Farmer Gene all the way to lunch without a snack! My favorite go-to: frittata, which I made last night with kale (check out my how-to here) or try steamed or sautéed greens in your omelettes or quiches or even in a strata! Blended into your Green Smoothies! I am certainly no expert on doing this…yet! CSA member Colleen is famous for her green smoothies! Here’s her “Kale Storm” formula: mango, banana, kale, spinach, lemon & apple cider. That sure sounds like it would wake ya up! To cook your greens may seem obvious, but really it is a great tip to get you to eat more of them by reducing their physical volume! On Wednesdays, I often stare at my fridge, with no clue where how to fit it all. If you are a CSA member or a gardener, might you relate?? Try the tip from CSA member Brita, and steam all of your greens from the week together to take up less space in the fridge. Yep, you can even add the tops of radishes or salad turnips, kale, chard, beet greens, Asian greens… You name it. Then you can add them to your stir-fries, frittatas, soups, etc. really quickly throughout the week. I don’t know about you, but if it saves space and time, I’m sold! Thanks, Brita! PS: You can even sauté lettuce to reduce bulk… Sauteed Romaine Lettuce anyone? OR portion them out individually into mason jars for quick grabbing for the next few days. The only catch you need to know about is, don’t put the dressing until you plan to eat it! Otherwise it will get soggy and you’ll be sorry. Wash your greens well and tear up into whatever size pieces you desire. Heat a large pot of water to a boil. Submerge greens into boiling water for 2 minutes. A removable steamer basket works well here, but is not required. Remove from boiling water and quickly plunge into ice-cold water to prevent further cooking. When cool, squeeze out the water from your greens. Pack into ziplock freezer bags, squeeze out the air, and label the contents with a date. Then in the winter, thaw up those greens and throw them into a stir-fry, soup, or cooked eggie thing (think omlette, frittata, strata, etc. etc.). You won’t be sorry you didn’t compost your greens during peak season! We hear this time and time again: that our CSA members love the variety that they get in their weekly CSA shares. They love trying new things (like Asian greens) and getting things that they wouldn’t otherwise buy from the grocery store (like kale). This seems counter-intuitive, doesn’t it? But, it is so true! I can say from experience that the CSA pushes me to eat more quantity and more variety than I would if I shopped at the grocery store. And this time of year it is super greens heavy! Do you eat as many greens as you would like? If yes, let us know what YOUR secret is to eating your maximum of healthy greens! If not, let us know which of these options was particularly helpful to you and that you might try!